Our mission is to provide affordable and practical medical education to outdoor adventurers through hands-on experiences. In addition to our course offerings, we also support multiple regional events. We support the annual Southeastern Student Wilderness Medicine Conference by providing organizational support and instructors. 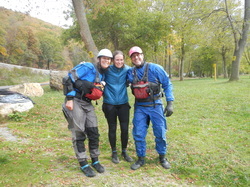 Three of our instructors serve on the non-profit board for The Appalachian Center for Wilderness Medicine and three others serve as members of the advisory council. We promote wilderness medicine education within the region. Blue Ridge Adventure Medicine is an organization created in 2012 to fufill a need for high quality affordable wilderness medicine education in the Southeast. The founders felt after hosting the 5th Annual Student Conference that there remained a need for more interactive and hands-on courses with scenario-based learning in the region. Blue Ridge Adventure Medicine is an effort to fill that void in the Southeast. 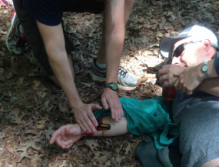 We offer a variety of general and activity specific wilderness medicine courses which can be tailored to multiple ability levels from the healthcare provider in the wilderness to the outdoor enthusiast with no prior medical knowledge. In 2014, we changed from an LLC to a nonprofit group as this was more inline with our mission.